Even though the code generated by QM™ is not intended to be edited manually outside QM™, it still needs to be understood and debugged using a traditional source-level debuggers. Also, some engineering organizations require all code, including auto-generated code, to comply with the internal coding standards. Such standards often dictate very specific commenting style, like provision of special file comments, function comments, variable comments, etc. To enhance the readability of the generated code and to meet the special commenting style requirements, QM™ can emit several kinds of various comments, all described in the following sections. to remind the reader right away that this file is generated automatically and should not be changed manually, as any such changes will be lost when the file is re-generated from the model. to inform the reader about the licensing terms applying to the generated code, which are the same as the underlying QP framework, as explained in the section Licensing the Generated Code. If you wish to add some additional comment at the top of your file, you can always put such a comment in the original file-item, which QM™ will then copy over to the file on disk immediately after the top-level comment described here. * This code has been generated by QM tool (see state-machine.com/qm). * DO NOT EDIT THIS FILE MANUALLY. All your changes will be lost. // This code has been generated by QM tool (see state-machine.com/qm). // DO NOT EDIT THIS FILE MANUALLY. All your changes will be lost. // Issued to   : Bamboozle Technologies, Inc.
QM™ allows you to generate comments from the documentation property that is available in many model items, such as classes, attributes, operations, and states. The feature of generating comments from documentation has been primarily designed to help organizations comply with the specific commenting style imposed by their internal standards. The following screen shot shows an example of the documentation property that generates comments. 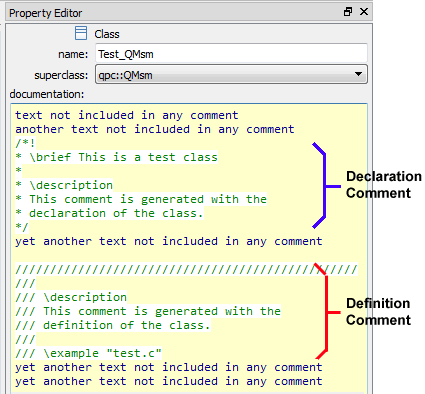 Specifically, the example generates a comment with the declaration of the class as well another comment with the definition of the class. If only one comment is found, the comment is considered to pertain to both declaration and definition of the model item. In this case this (same) comment is generated with the declaration and with the definition of the model item. All other text in the documentation property preceding or following comments has no implications for code generation. Such text is considered internal model documentation. As illustrated in the screen shot above, the comments in the documentation property can contain special markup, such as Doxygen, Doc++, RoboDoc, etc. Select a piece of code containing the desired model-link comment and copy it into the Clipboard (Ctrl-C), which you can do from virtually any code editor or debugger. The divider comments often contain the Fully-Qualified Item Name of the model item that follows, so you can use the divider comments to quickly open the referenced model item as the Current Item in QM™, as described in the previous section Model-Link Comments.